spending many years in the United States. Its design is an attempt to mix the “Eastern connotations” from their upbringing together with traits derived from the “Western spirit”, resulting in a living space that reflects the individuality of the owners. At the same time, it combines Western modern mastery with the distinguished characteristics of Eastern inner-balance. Aside from essential drawers and cabinets, we tried to leave the walls as blank as possible, allowing users to fill them with their own “life elements” collected over many years: souvenirs, paintings, photos, furniture…fragments of life. They all form a most unique texture to a living space - using elements from distinct and personal lifestyles to transform a space into a house with its own soul. A house serves as the scene of life, while its residents are protagonists who use their lives to build a complete “home”. This residence is located in the warm, sun-kissed region of southern Taiwan. In the interior, every main room is connected to a balcony, terrace, or patio. This design creates intermediary filtration spaces between indoor/outdoor light and the green areas through its balconies, terraces, and atriums. This filters the strong sunrays coming from the outside into a soft light, which diffuses itself into the rooms. Light is also simultaneously directed into the natural green landscape areas. 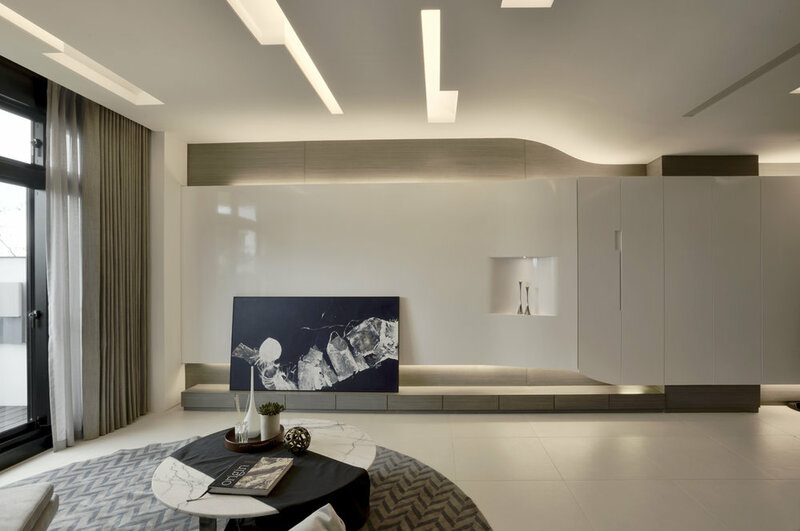 The interior interacts with light through the soft, curved walls. Each day at different hours, slightly different expressions of light are captured, changing the indoor atmosphere according to the weather and making it become alive. These walls also connect the main elements to the interior and exterior spaces. Through the rhythmical walls, ceiling and lighting, an internal sense of openness and breadth is created, guiding the space from inside-out. Outside-in extensions and combinations blend life with nature, making it possible to conduct daily activities by stepping outside. Finally, the depth obtained by the differently shaded walls echoes the different properties within the living space, creating a diversified and rich spatial experience. As a result, the occupants are able to select and settle in their own corner of the house according to their mood at that moment. 住宅空間最特別之處就是室內的每個空間裡都有一個陽台, 露臺或天井, 得以讓住在內部的使用者無時無刻可以感受到外部大自然的變化而讓室內的分為可以隨著室外天候改變氛圍, 同時可以走到露臺或陽台上直接與大自然接觸與互動. 由室內, 半戶外, 倒戶外的體驗得以讓生活的空間層次豐富化. 在空間手法上, 我們透過律動的牆面, 天花與照明去在營造出室內的開放性與寬廣度並引導空間由內而外, 由外而內的延伸與結合, 讓室內與戶外融合, 成為生活感受與活動的一部分. 在透過牆面的深淺去區分出空間的生活屬性. 而除了生活上絕對需要的牆體與櫃體外, 我們將空間主要的牆面都留白, 來讓使用者的”生活元素”來注入這個空間的靈魂, 也就是居住者最獨特最個人化的生活模式. 例如他們在國外四處收藏的紀念品, 畫, 照片, 傢俱..生活的點滴, 都是空間中最的一無二的質感.我們設計出生活的舞台與場景, 讓居住者在空間裡活出他們自己的故事篇章.